We at Miloco love Pledge Music. We think it is a great way for bands and artists to operate without needing a major label. The Company has been thought through carefully from inception and it really is working. If you are a band with a fan-base and need to raise money we seriously think you should look at this fantastic model. Pledge Music provides fans and artists the opportunity to work together to make new records and raise money for charity. By combining new social networking technology, old school music biz know how and an irresistible menu of exclusive incentives, fans can visit the site to hear great new music, enjoy and share unique experiences with the artists they love and actively participate in the release process. Pledge Music offers fans the opportunity to fund their favourite bands or solo artist’s new album. In effect, you as the fan become the record label the band or solo artist is recording for. You help fund their record and if they don’t reach their pledge target you won’t get charged a cent. In exchange for your early involvement, you will get the music the moment the recording and mastering is finished. Additionally, if you wish to contribute a little bit more, Pledge Music artists also offer you a range of incentives, ranging from signed merchandise to special events with the band members and in some cases personal involvement in the release process. These are specified by the artist and vary for each project. How is Pledge Music different from other music sites? Pledge is run by music people. Between the team at Pledge HQ, we have written and released 11 records, played a frightening number of shows, managed bands, signed hundreds of acts who sold millions of records, marketed and developed big bands who had big hits and little bands who should have had big hits. It is a collaboration between modern online marketing and old school music biz know how. So we know what it feels like to be a fan and a musician. Also we have provided the option for the bands to make a charitable donation because we feel music is about giving as well as making, taking, sharing and listening. We take only a 15% commission on funds raised. Artist retains 100% of their rights. Artist chooses where to record and with whom. Artist can opt in to making a charitable donation. Pledge recommends third party services to help complete the release process. *unless the fan chooses to use PayPal in which case the full amount is charged at point of purchase, and will be refunded if the project does not reach it’s pledge target. Pledge Music offers you the artist the opportunity to fund your recordings, touring, in fact any band associated activity, whilst also bringing you closer to your fans. Each recording project is submitted to Pledge Music and assessed personally for success based on previous similar projects, mailing list size, shows played and how good the tunes are. We’ll also contact the studio and make sure that you’re getting the best rates. If we think that you can raise the funds it and your preferred studio is available then the project is approved. Once a project is given the green-light from Pledge Music an application for MySpace and Facebook is created, which tracks the funding progress and fans can add badges to their own sites and pages. Pledge Music contacts the artist’s mailing list and lets them know about the project. Once the pledge target is reached Pledge Music releases the funds direct to everyone involved in the recording and the project is underway. And with Pledge Music involved you’ll always get the best rates, wherever you choose to go. Whatever stage your project is currently at, from writing to mastering, Pledge Music can help you, whether you need a whole project funding or you just need to fund a promotional tour. As long as there is a deliverable to incentives the pledge we can help you. Pledge will recommend established companies which may be useful to you in manufacturing, releasing and marketing your finished record. To sign-up just fill in the details about yourself or your band and when you’re ready fill in the New Project form, it’s incredibly simple. You don’t have to finish this all at once, and you can invite the other members of your band to review it before submission. If you’re unsure about any part of the process email us at any time and we’ll be happy to help. We then contact everyone involved in your project, make sure that it’s all ready to go, negotiate the best rates where possible and setup the project for you – we aim to get back to you within 2 days but that’s dependent of getting hold of people so it may take a little longer if you want Quincy Jones, or Mutt Lange as your producer. We don’t collect any of your fans contact details and we will not contact them unless it’s about your project. How Pledge Music makes its revenue? Principally Pledge Music makes revenue from charging artists an administration fee of 15% for every successful pledge made once the pledge target is reached. We absorb all card processing fees and overheads in this amount. There are no hidden costs – its a flat 15%. If you are assessing your options and looking at other fan-base fund raising sites, please be sure to check their policy on fees and hidden transaction costs. Our policy is that we don’t have any. When you reach your pledge target we transfer the funds into a dedicated artist account that we can only access to pay you, the charity, or studio etc. So in this way we can ensure that you get what is due to you. 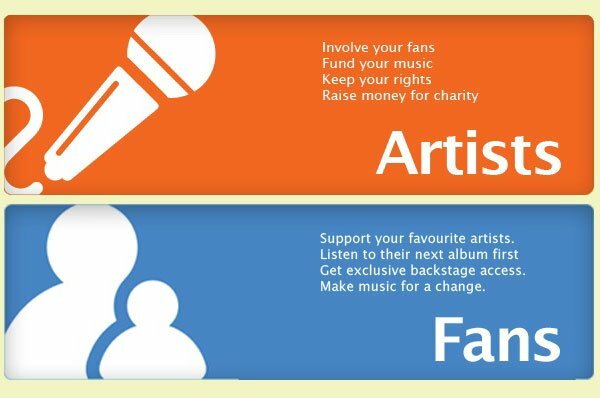 If you fail to reach your pledge target then your fans are not charged a penny. Can fans use Paypal to Pledge? They sure can, although all Pledges received using PayPal will be charged immediately though our system and will be refunded if the project does not reach it’s pledge target. Sorry about this, it’s a PayPal thing, not a Pledge Music thing. Pledge Music will only transfer funds out of the Paypal account once the project has reached its pledge target and not before. When do people get paid? Pledge Music after taking our commission of 15% releases 75% of what you have raised to the artist 7-14 days after reaching their tipping point, and the remaining 25% upon the artists uploading of the project to the Pledge Music site. On Projects of over $10,000 this settlement can take up between 14-28 days. If the project goes over 100% of their target this balance will be paid to the artist upon delivery of all incentives to the Pledgers. All charitable contributions will be paid upon upload of the artists project to the Pledge site. What else can I fund through Pledge Music? Watch this space, we are open to any suggestions and will be offering services for all kinds of fields once we got this one streamlined. Please email any requests to newfields@pledgemusic.com. Do Pledge Music Projects expire? There are three options. We work on the assumption that you should be able to raise your money in 30 days, 60 days or 90 days. After three months the Project will be taken off the main pages but will still be searchable. This will give you time to try and build up your fan base and or reduce the scope of your project. Can I edit a Project after it is approved and launched? You can edit everything except the campaign terms. Changing it is akin to rewriting a signed contract. How do we come up with your budget numbers? We do some simple maths based on the number of email addresses you have, and then how many people are on your MySpace and Facebook. If our number comes out too low or high and you are concerned you can always email us and let us know. For example if you think you can raise more than we do we will work with you to get to the right goal. Remember that you will probably raise more than your actual target anyhow. What happens if we get close to the pledge target but don’t quite make it? Pledge Music wants you to succeed and so we will try and keep you from attempting a project that you cannot complete, but if you get 75% through and things are slowing down we would advise you to either, try a shorter record, so rather than an album an E.P. etc or you can always ask Mum, or anonymously donate the extra yourselves. What if I want to record at my place as I have a home studio? This is fine, but we could only release 50% of the funds to you at the start of the recording and the remainder once the project is uploaded onto our server. Then what ever is left is yours. What happens if the artist finishes in the Studio with time to spare? Longer guitar solos? No but seriously normally we would split the balance owed between the studio and the artist. What if we don’t complete our album? If the band breaks up in the middle of the recording, we will email those who have Pledged stating what has happened and we will offer them four options. Getting the remainder of their money refunded back to them. Sending the remainder of their available money to the charity the band chose before the pledge started. Pledging into another project on Pledge Music’s site. Sending the money to whoever started the pledge in the first place. What if we are with a label at the moment? We are working with a number of labels to assist them fund and market their releases. Even if your label is not interested in working with us we could look at funding something that falls outside the deal that you have with them. i.e. we could fan fund re-release of back catalogue, a compilation of rare releases or fund a tour or merchandise. Maybe your record label will recognise the strength of what we do and we can all work together on a follow up project. What if we get offered a deal whilst the Project is in progress? Good for you! You own all the rights to your recordings and you may exploit them in any way that you like! If it has reached the Pledge already, then you will need to honour the obligations to your fans. If it hasn’t reached the pledge then you can either incorporate it into your new deal or if you really want to we can cancel the campaign and your fans will not be charged. It’s all-good! We want our music on iTunes and all those other digital sites! OK, we will have deals worked out with strategic partners to make this cheaper for you and get you the best rates we can. We will take a small percentage as an admin fee for doing so, to pay our accountants. We can also sell the downloads direct from the Pledge Music site as well. It’s all up to you. You can record covers and use samples if you wish to but you will need to clear all the rights to do so before hand. We cannot however have you upload them to the Pledge Music site until we have seen that you are authorised to do so. So before your campaign starts we’ll need originals only please! How do our fans get the things they’ve pledged for? That’s down to you. We help by recommending a list of companies we think are great at getting the job done for you, but it’s down to you to make sure the fans feel loved and cherished. What if we raise more money than we asked for? Then congratulate yourselves on the good work!! Minus our commission for helping to raise it, we send the money straight to the artist once the record has been delivered, minus any charity money owed which goes straight to the charity. How do I add the Facebook application? Go to apps.facebook.com/pledgemusic, and install the application. Are there any additional charges to Pledgers? Pledge Music does not add any additional charges whatsoever for Pledging, however, we have seen that certain banks outside of the UK, US banks in particular, have seen fit to charge up to $3.50 as a transaction fee. We are not happy about this but it’s something that some banks/credit card companies do and some do not. When it is brought to our attention ask the Pledger to check with their bank or credit card company and to see if they can get it removed. For more details on Pledge visit there website at www.pledgemusic.com.